Pre and post operative radiographs of a patient with Flat Feet. The radiographs show a dorsilateral peritalar subluxation (the arrows). 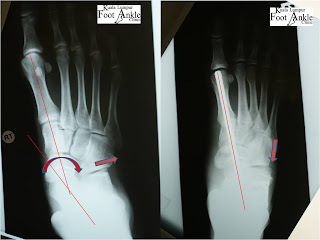 The radiograph of the right shows the reconstructed deformity with the midfoot fusion bolt and x-plate. Flat foot is a very common problem and for many, it may not cause any problems at all. Problem start to occur when the deformity worsens and leads to malalignment of the axis of the limb leading to imbalances in the ankle, knees, hips and back. Flat foot can be congenital or acquired during the adult life. The shape of the foot is determind by many factors such as genes, bones, muscles, supporting tendons and ligaments. Any pathology or injury to these structures can lead to flat foot. A foot that is flat is structurally at a disadvantage compared to a normal one. Although it may be without any symptoms of pain, the altered mechanics leads to increased stresses and strains due to normal day to day load. This is due to inflammation and degeneration of the tibialis posterior tendon. This leads to gradual pain, swelling and flattening of the arches of the foot (flat foot). It is often missed and may lead to serious permanent disability. Osteoarthritis of the joints (tarso-metarso and subtalar joint). The reasons for arthritis of these joints may be trauma, inflammatory or degenerative but if left over time will lead to pain and progressive deformity. Most patients with flat foot canbe treated with orthotic footwear. Flexible flat foot can conform to inner soles worn in the shoes. Insoles can be custom made to correct the flatten arches of the foot. In addition to this, physio will be require to stretch the muscles which are frequently contracted due to flat feet. Surgery for flat foot ranges from tendon transfers, bone reshaping, fusion and releasing of muscle contractures. Patients will invariably be in a plaster cast post operatively to allow for healing of the soft tissue and bones prior to resuming mobility. Surgery is aimed at correcting overall alignment of the foot and to prevent abnormal malalignment stresses on the surrounding joints of the ankle, knee, hip and back. Should you have any enquiries about flat foot, please consult you Consultant Foot and Ankle Surgeon. hi doc.. just wondering.. how much does that operation costs?